Kids will take a virtual tour of the factory floor by learning how all those products are moved around the plant. 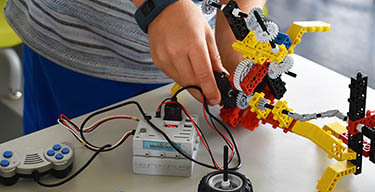 Students will learn about the different types of conveyer belts—and then build working versions that using our LEGO project kits that are motorized to move product. From a buffer conveyer to a step conveyer, from a trash compactor to a pick and place robot—this one is one of our favorites! At the end of the session, each child will create a custom Lego mini figure to keep!